Eighteen-time winners Bayern Munich will travel to third-division Paderborn in the DFB Pokal quarterfinals in February. Paderborn were relegated in back-to-back seasons in 2015 and 2016 and only survived an unwanted hat trick after Bayern's local rivals 1860 Munich failed to gain a licence to play in the third tier after suffering relegation last summer. "We will never underestimate an opponent, but we are pleased with the draw," Bayern sporting director Hasan Salihamidzic said. "We could have met a first division side and I am confident that we will progress." Bayern's only previous cup meeting with minnows Paderborn came in August 2001, when the Bavarians won 5-1 in the first round. Paderborn currently sit in second place in the third tier and have seen off second division sides St. Pauli (2-1), Bochum (2-0) and Ingolstadt (1-0) on their way to the last eight. Only Bundesliga sides remain in the other ties with Eintracht Frankfurt hosting Mainz in a local derby, five-time winners Schalke handed a home game against Wolfsburg, while six-time winners Werder Bremen visit Bayer Leverkusen. 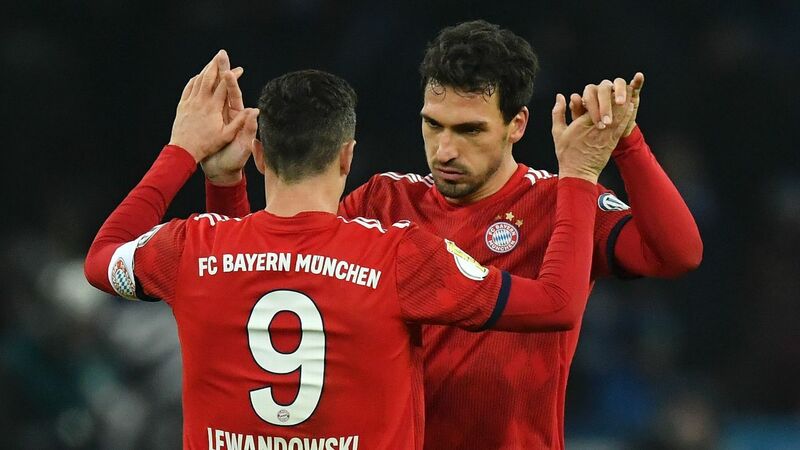 The quarterfinals will be played on Feb. 6 and 7 with treble-seeking Bayern aiming to reach the last four of the competition for a ninth straight season. Mark Lovell covers Bayern Munich for ESPN FC. Follow him on Twitter: @LovellLowdown.